Seen as one of playgrounds of Australia, The Gold Coast on the east coast of Queensland offers much to visitors. Stunning beaches, active nightlife and a wide array of eateries and dining restaurants make for a great holiday destination. 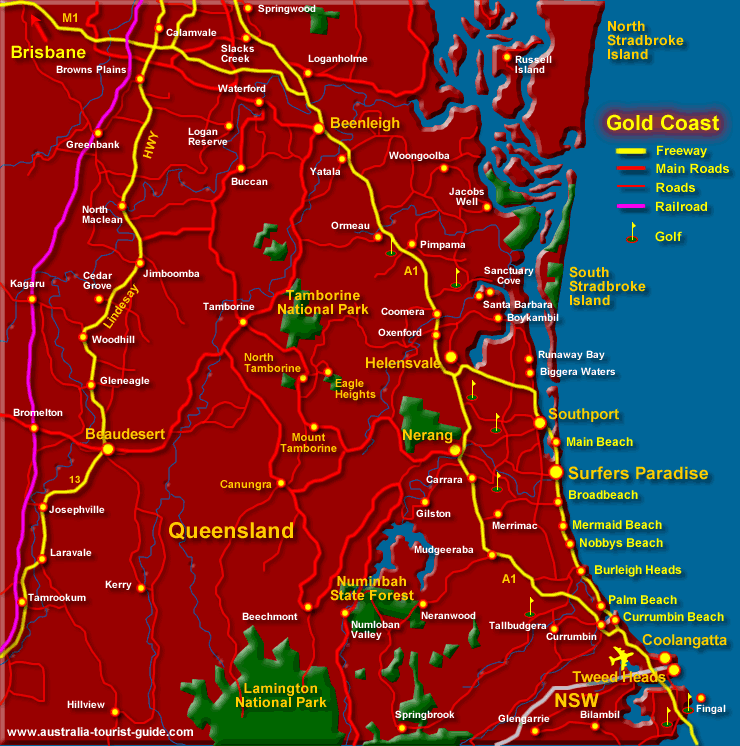 The Gold Coast Airport is located at Coolangatta, found on the south east part of the map. The green hinterland has a number of National Parks with sweeping vistas, including Lamington National Park and Tamborine with South Stradbroke Island just off the east coast. There are a raft of things to do for the whole family, besides the many patrolled beaches with year round swimming, there are thrilling theme parks and nature parks, where you can get upclose to many of Australia’s wildlife and multicoloured birds. Beenleigh, Southport, Surfers Paradise, Mermaid Beach, Nobbys, Burleigh Heads, Nerang, Palm Beach, Coolangatta and South Stradbroke Island. State, National and World Heritage Listed Parks can be found here, including Tamborine National Park, Lamington NP and Numibah State Forest. About the Sunshine Coast, QLD and about touring the East Queensland Coast. See more: Queensland Tourist Guide - Brisbane, Regions, Maps and More. To the south of Queensland - more about South Australia SA. Victoria has lots of attractions and Melbourne Victoria. See more about Canberra ACT. See the Canberra Museums or the Canberra Attractions page for details. Also Map of Canberra, ACT. Curious about working and employment here - Work in Australia - Jobs. Queensland accommodation includes luxury and budget hotels, motels, beachside resorts, convenient family orientated caravan parks, bed and breakfasts and farm stays.